The film starts with the words KALEIDOSCOPIC CITY: this is how Stefano Boeri Architetti (in collaboration with UNLAB and IND) sees the future of the Albanian capital, Tirana, written in bold capital letters, for an open, eclectic, permeable city. 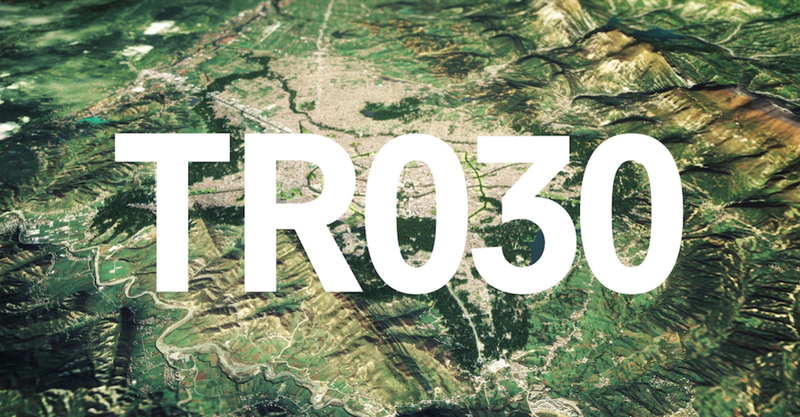 Boeri's "vision" for the future of Tirana from now until 2030 (TR030) could be defined, in large part, as a plan for landscape recovery, a kaleidoscopic city that can rely on a new instruments which may allow more coordinated and comprehensive management. Stefano Boeri Architetti calls its plan a "metropolitan fresco", recalling the typical Medieval and Renaissance technique of painting used to depict large scenes on walls, usually representing religious or mundane scenes that would help the citizens to learn more about themselves. Edifying, enlightening or simply didactic, these enormous paintings helped people in understanding the place they lived in or in predicting what would come next. In fact, the video by àttustudio starts with what might be the most iconic "metropolitan fresco" ever painted: the "Allegoria ed effetti del Buono e del Cattivo Governo" by Ambrogio Lorenzetti for the city of Siena: painted in 1338, it is still teaching both citizens and politicians on how to manage a city. Using maps and animated city models, àttustudio presents the various aspects contained in Stefano Boeri Architetti project for TR030, which is based on ten main themes (biodiversity, polycentrism, diffuse knowledge, mobility, water, geopolitics, tourism, accessibility, agriculture and energy); an Atlas consisting of thirteen strategic projects located in the real landscape and a Chart of rules formulated around five metabolic systems (nature, infrastructure, city, agriculture and water). A not so different way to present a plan to its public from the Ambrogio Lorenzetti's one, where society, communication, infrastructure and agriculture were painted side by side. Stefano Boeri Architetti's strategy relies on the creation of gaps to generate public space, as well as on nature and farming to absorb the diversity and complexity within the new city limits. At the centre of it there is the relationship with nature, a theme envisaging various strategies: a continuous ring of woodland around the metropolis, including parks and protected nature reserves that will preserve and boost the existing biodiversity; new environmental corridors along the Lanë, Tiranë and Erzen rivers; a green belt (the new 4th ring-road) around the centre of Greater Tirana, functional as a linear public space and as a link for the transport network as well. It will take more than 10 years to see this plans completed, but TR030 is already starting to unfold itself, building its new face piece by piece. The first is the Blloku Cube, a new multifunctional center signed by Stefano Boeri Architetti, now under construction, Located in the heart of Tirana, in the same urban district as the historical residence of Albanian Communist Party leader Enver Hoxha. The identity of the building is strongly characterized by a special cladding, a stand-out feature that makes it recognizable and unique in the city skyline and, at the same time, highly performing in terms of thermal efficiency, thanks to a "double skin" technological system. "The resulting effect is that of a vibrant and iridescent surface, a pattern of aluminum triangles playing with the sunlight to create reflections in different nuances of color", explains Stefano Boeri.